It just got better. Let’s talk about LoPro at Downtown Cocktail Room for a minute. I love it. Thursdays from 4–8, my favorite happy hour goes down at 111 S. Las Vegas Blvd. There’s a valet. Sometimes the valet’s busy running around doing his job. Sometimes I’m impatient & just drive through the alley & park on 6th between Carson & Fremont, throw a few quarters in the meter, & head right in for a basil mojito (custom delicious brilliance developed by George the bartender). Sometimes those quick lil’ b*****d’s in the parking enforcement golf carts beat me back my vehicle. (OK, sometimes I’m just having too much fun or too many mojitos to remember i need to re-deposit coins) My point is this: there’s nothing cool about coming out of the bar, or where ever you may be and finding a $20 ticket that would have cost you a quarter to prevent between the hours of 8AM & 8PM. This may still be the case on the extended lunch meeting, or other such mid-day recreation. However, with LoPro starting at four, and most meters I’ve encountered near the hot new Fremont East having a 2 hour time limit wouldn’t it be great if Mr. Goodman (who I met at LoPro a few months back) could make it a bit easier for those of us who get lost in the sultry ambiance of mojitos, maroon, bamboo & leather? Well, I’m happy to report that someone in his crew must have gotten the message. I jogged down the street a bit, and no wait am I in heaven? 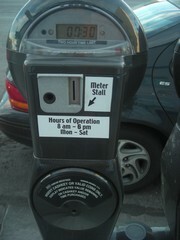 Every meter on Carson was now shined up with a new ‘hours of operation’ sticker displaying operating hours of 8AM-6PM! That’s right, despite the two hour limit, if you’ve got two bucks in change lodged in your seat or console, you can now deposit 2 hours worth of time, arrive for the first sips of LoPro, and stay as long as you like. With no nasty $20 hang over payable to the City of Las Vegas! Good move parking enforcement guys! It looks like most of the meters around the Fremont East Entertainment District have already or will soon change to 8–6, but double check, I’m not paying your ticket. I snapped this pic yesterday as I was on my way to LoPro once again, where I caught up with Amy & Candice from Vurb. These two lovely ladies hinted that there may be a very cool Vurb Magazine party coming soon. I’m sure they’ll let you know about it soon, especially if you’re staying up to date with their hot new web site. Of course, we’ll post info on the event as soon as they give us the go ahead!